Yesterday was a bright, cold day, with a ripple of agitation as the unseasonable warmth from the beginning of the week was blown away by the cold damp air of today. The sky was white blue, and the late afternoon produced the sort of slanting golden light that tricks you into thinking it’s warmer than it is. And on this late-fall afternoon, you could find me riding all over town, wearing Isaac’s backpack, on Malcolm’s BMX bike. Malcolm’s been home from school all week, and I wanted to pick up his homework and prescription, but I didn’t want to leave him alone too long, and I felt too lazy to haul my bike out of winter hibernation in the basement. So here I was, wheeling around town on a small, bright Tintin-blue BMX wearing a small bright serpent-green backpack. It felt good – the cold air in my lungs harsh but cleansing, the cold air washing through my stale, lack-of-sleep addled brain clearing off the cobwebs. I had this strange sensation – hard to place, familiar, but remote – something I hadn’t experienced in a while. And then it came to me…I felt cool. I felt like a cool kid. I nearly laughed, but that wouldn’t have been cool. I realized that I didn’t feel, for a moment, like a tired and anxious 43-year-old on her son’s BMX. And, of course, that realization brought it all crashing around me, because I was a tired 43-year-old on her son’s BMX. Malcolm’s back in school today, and he told me they’re having an assembly with a BMX ramp and, I assume, skillful young BMXers doing tricks. Wouldn’t it be funny if I came flying down the ramp at the assembly? Waving and shouting, “Yoo hoo, Malcolm! Yoo hoo! It’s mommy!” Heh heh. So Malcolm and I have had a nice week, it’s cold and rainy today, and I miss having him around, though, of course, I’m glad he’s glad to be back in school. While he was sick he craved brothy foods, and this was just such a meal. It’s quite substantial and has a lot of strong flavors, but they’re all flavors that I love, that work well together. It has a bit of zing to it, which transcends the potential (pleasant) stodginess of beans and potatoes. It’s a good meal for any time of year, really…in the winter I tend to stock up on jars of artichoke hearts and roasted red peppers to relive some of that summery flavor that you can capture fresh in other seasons. I like a nice crusty bread with my stew, so I decided to make one myself. I wanted it to be chewy and dense, but not with a fine crumb. So I added some cornmeal to the mix. And I kept the dough very wet – I had to use the food processor rather than my hands to knead it. I baked it in a bowl that I’d lightly greased, and it got stuck, so I had some trouble getting it out, but it was still delicious. Just a little messy, so you had to pull it apart with your hands, but that’s not such a bad thing!! I guess you could try a non-stick loaf pan, or just mound the dough onto a greased baking sheet. I’ll try it and let you know how it goes!! Here’s Loch Lomond’s strange and beautiful Wax and Wire, in a video showing the most amazing BMX riding courtesy of Danny MacAskill, and the most beautiful landscapes, courtesy of Scotland. As I hinted yesterday, cooler weather marks the highly anticipated return to stew season, here at The Ordinary. The excitement is palpable – akin to fashion week, really. What kinds of greens will we be eating this year? Will we be cooking red beans or black beans? Small white beans or large white beans? Are chickpeas still in fashion? Of course they are! And we’ll be cooking all the beans! All the greens! This particular stew is a little spicy. It has collards, pink beans, potatoes, carrots and tomatoes. It’s saucy and flavorful, seasoned with sage, smoked paprika, and cumin. If you can’t find pink beans, you could use red, pinto, or roman. 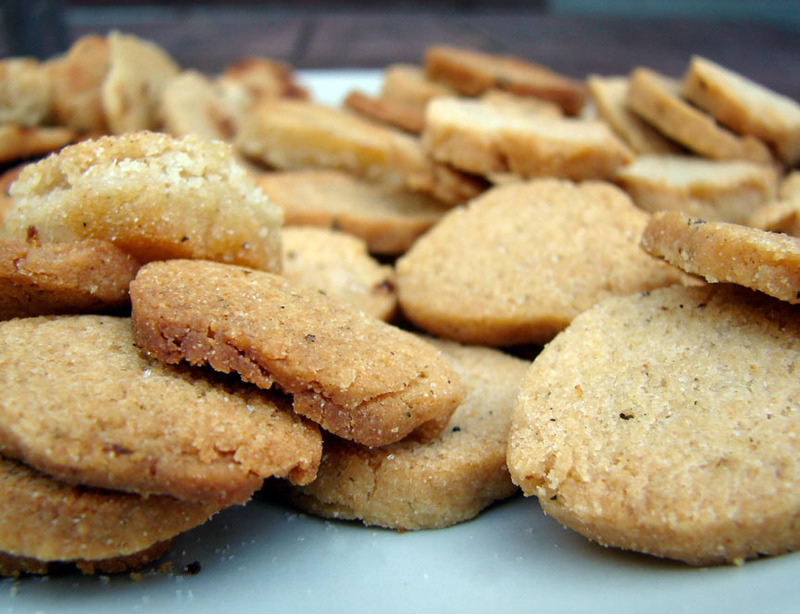 I made the little crackers with masa harina, and they’re yummy, too. They have a little kick, because they contain cayenne. I fried half in olive oil on top of the stove, and I baked half in olive oil in the oven. The baked ones came out very crispy and quite hard – perfect for dipping in soup, although a little too hard to eat on their own – like rusks, I guess. The fried ones are nice as a snack, though – crispy outside, soft inside. Here’s Jimmy Smith with Come on Baby, from Home Cookin. We visited Monticello last week. It’s so full of beauty, light, and grace that it made me weepy. Less than a mile away, in the visitor’s center, is a recreation of one of Jefferson’s slaves’ dwellings. It’s dark, gloomy, and cramped. That made me weepy, too. Jefferson designed the house with all of the “dependencies” – where the work was done – hidden beneath the building in catacomb-like tunnels. The word “dependencies” struck me as a funny one, in this situation. As you walk through the house and grounds you realize that Jefferson and his family had a complete and childlike dependence on their slaves. Their slaves dressed them, raised their children, grew their food, cooked their food, made their furniture, dug their graves. The man who dug Jefferson’s grave was named Wormley Hughes. He worked in the garden. The garden at Monticello is a thing of wonder. Beautiful, useful, inspiring – a perfect spot to sit and ponder questions of liberty and independence. Wormley Hughes was freed after Jefferson’s death, and shortly thereafter, his wife and 8 of his children were divided and sold. It’s a discombobulating experience, visiting Monticello. So much beauty, and cleverness – so many good ideas being exchanged, and important work being done. And literally hidden beneath all of it, so much pain and suffering. Sorry to go on about it! It’s on my mind. I did buy some seeds in the gift shop, to plant in our garden. I’m very excited about our garden this year. 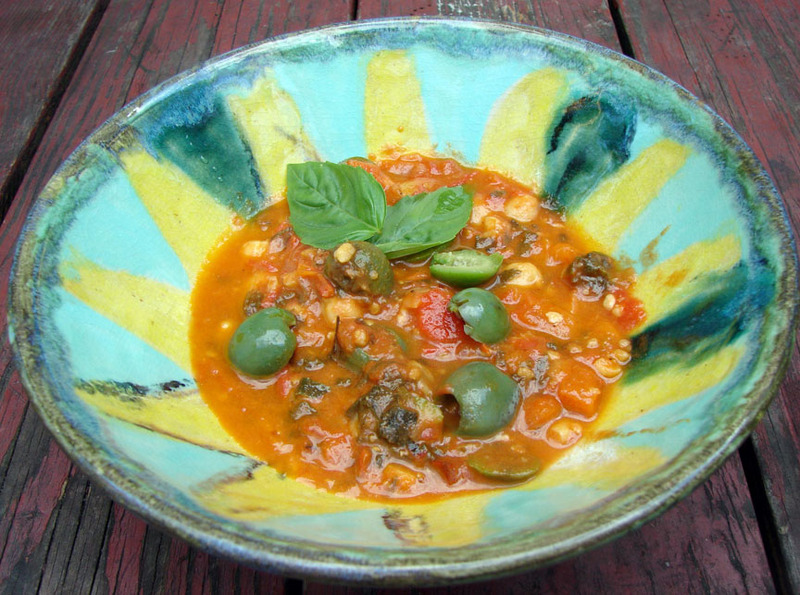 We have about 8 kinds of basil, and that’s what I used to make this dish! 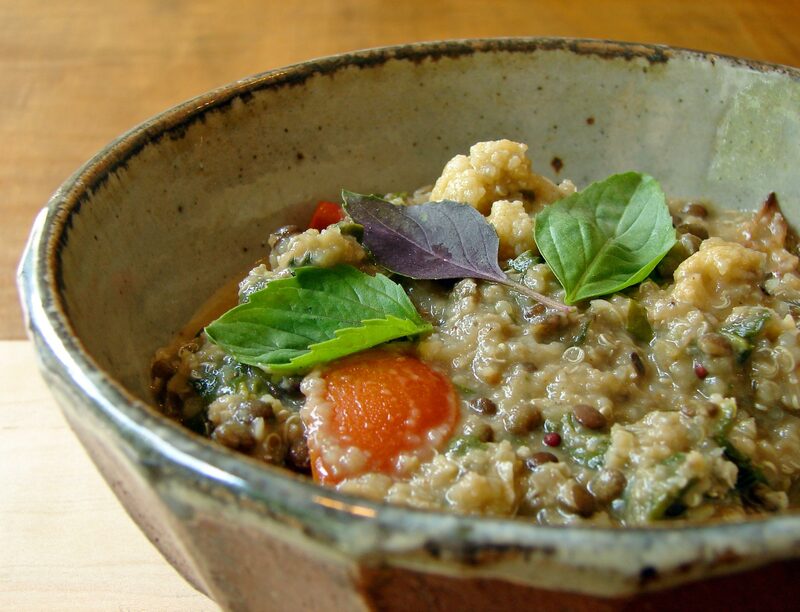 Back in the Ye Olde Days, they used to have “potage gardens,” and the fruits and vegetables grown there would be used to make potage, a thick stew or porridge. 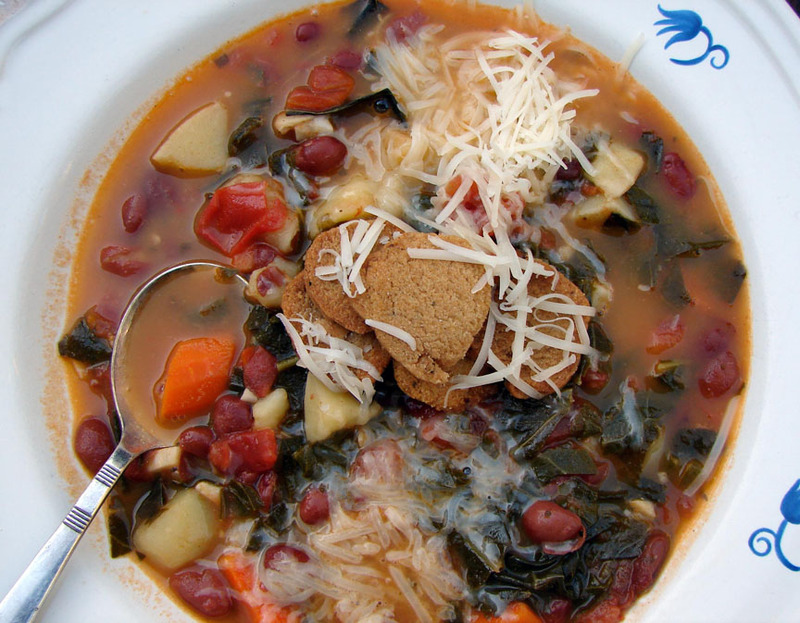 The potage combined all of the different elements of a meal in one bowl, and was a staple in the diet of peasants. 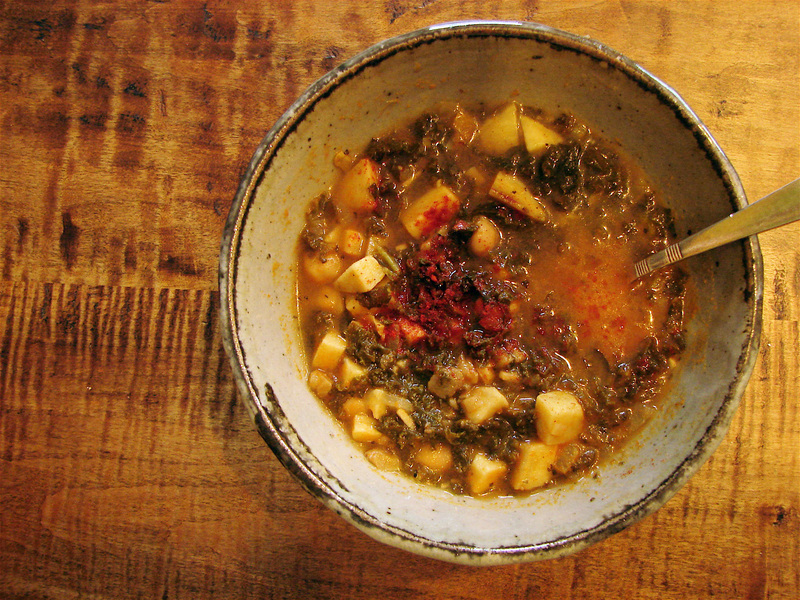 This particular potage contains 4 kinds of lentils – beluga, french, red, and split moong. The beauty of this, is that when they’re all cooked together, the quick-cooking varieties (I’m talking to you, moong & red!) melt into a creamy background, while the slower-cooking types (french and beluga) remain a bit al dente. So you have a nice mix of textures. 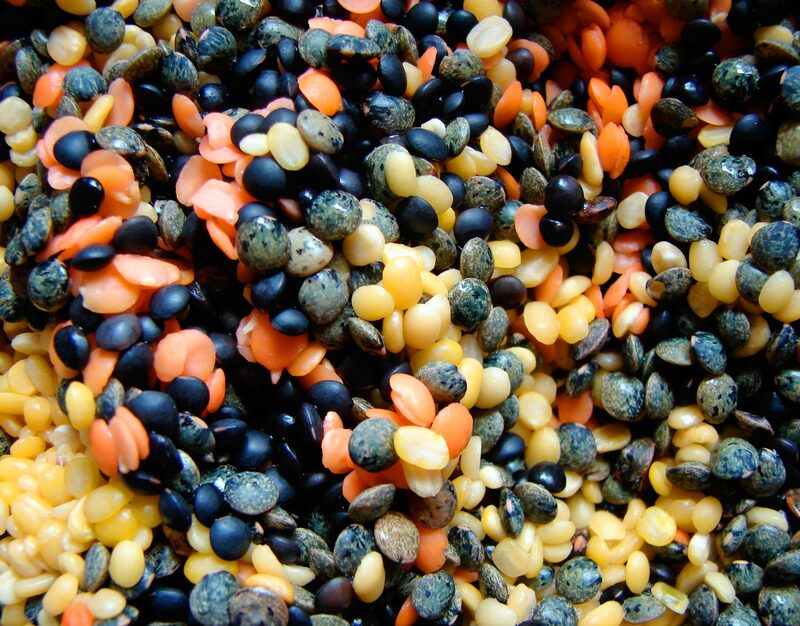 If you can’t find beluga lentils or split moong dal, you could make this with french and red, which are both fairly easy to locate. I roasted the cauliflower separately, because I like that smoky flavor, and then pureed half with broth, and added half whole. This is quite a thick, satisfying dish, and it’s flavorful as well – seasoned with ginger, smoked paprika and tons of fresh basil. 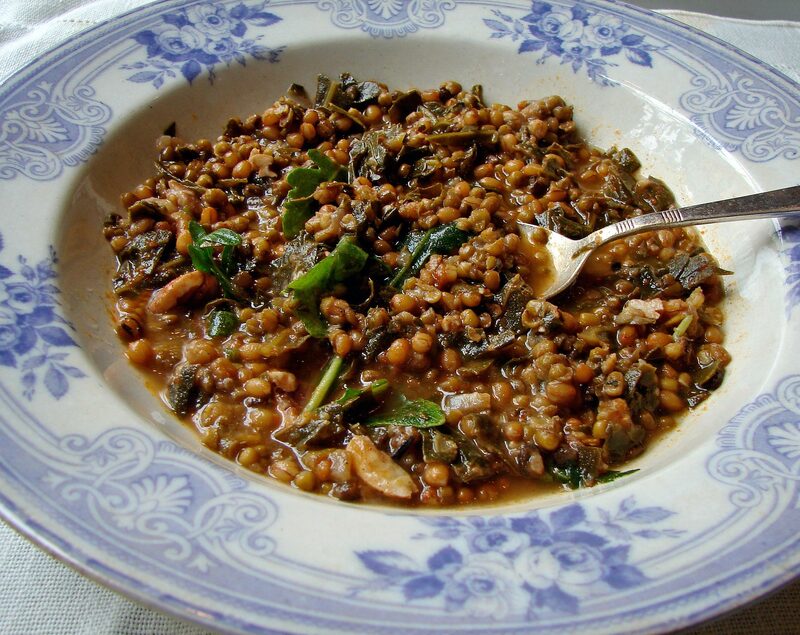 It’s funny, though – lentils are so pretty when they’re raw, and so drab when cooked. They make up for it with supreme tastiness, though! Here’s Blind Willie McTell with Amazing Grace. He doesn’t sing, but it’s almost as if the guitar is speaking the words. Isaac is home from school with strep throat. We’ve drawn a little book of bugs, drawn mixed-up dinosaurs (Isaac declared himself “pretty impressed” with my mixed up pteranadon/prehistoric shark! ), and we’ve gone to the doctor, where he danced all around, charming the nurses, and didn’t seem very sick at all. It’s been a cold and rainy couple of days. Perfect for lying around in PJs drawing dinosaurs. Perfect for making brothy, flavorful stews in your slow cooker!! This stew combines hard red winter wheat, moong dal and collard greens – a green that can stand up to a long cooking-time if ever there was one! Hard red winter wheat (also called wheat berries, I think!) 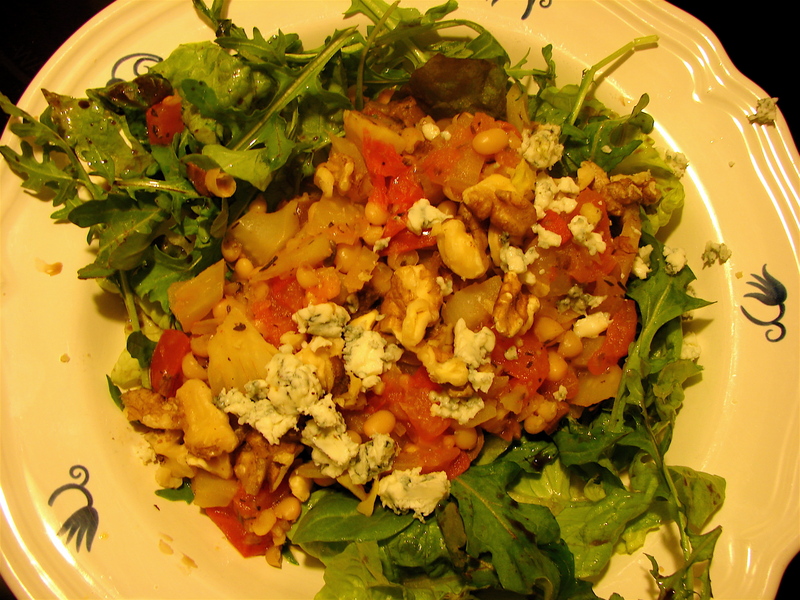 is pretty and very tasty, but needs to cook for a while (hello, slow cooker!). I chose to pair it with moong dal because whole moong dal, which also needs to cook for a very long time, is so bright and pretty and green, and looked so nice with the red winter wheat. An aesthetic culinary pairing! Of course, when they’re cooked they both pretty much look brown – but pretty tawny brown! If you don’t have moong dal on hand, you could use any other dried bean in this stew. Black-eyed peas might be nice! The broth is smoky and a little sweet, with a kick of cayenne. The texture of the stew is quite nice – the moong dal becomes soft, the winter wheat remains a little chewy, and everything retains a bit of its original character, though it all goes well together. Here’s Chico Hamilton with Mulligan Stew. I love this! I’ve been feeling super blechy the last few days. Headache, stomachache, sore throat, the ague. I’ve got the ague, I tell you!! So I wanted to make something spicy and flavorful to clear the sinuses and get past my dulled palate. 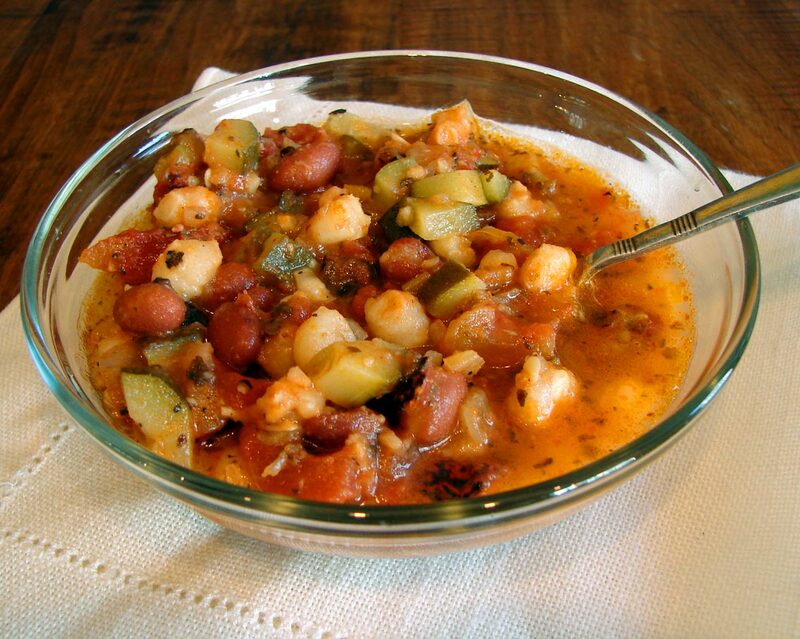 So I made this stew…red beans, zucchini, hominy and some spices – lots of spices. Hominy is, as I understand it, corn kernels, skins removed, treated with lime. Round here, you can buy it in cans (Goya! Oh boya!). It has a mysterious taste and a lovely texture. Soft but firm. It makes a very very nice addition to a saucy spicy stew. This stew was so pretty when it first started cooking – red, green and white. Lovely. To go with it, I made these tasty little…good golly, I’m not sure how to describe them! 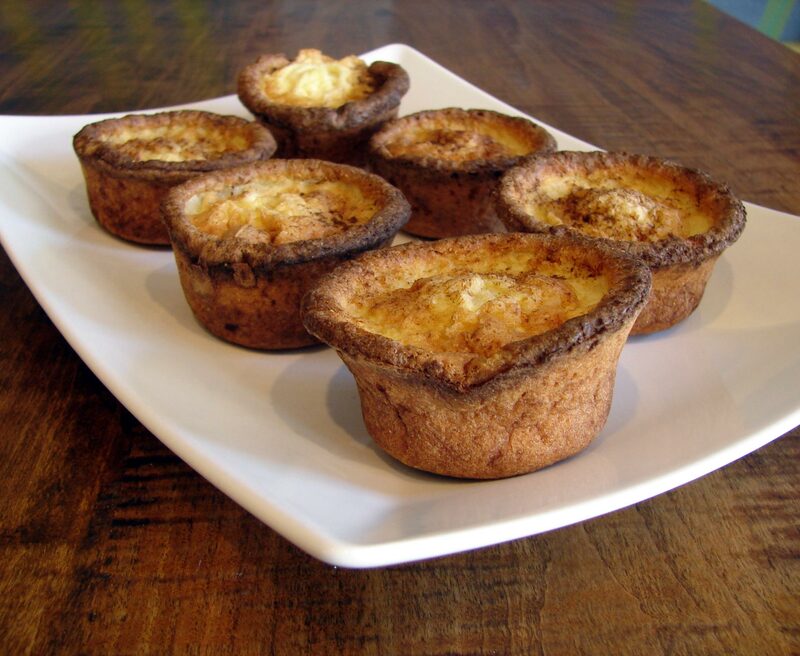 They’re not popovers, not muffins. For all the world, they’re like tiny little quiches. They make their own crust…of cornmeal toasted in brown butter. And the inside stays very dense and eggy and ridiculously comforting and tasty. They’re quite magical! They’re not hard to make, and I think they’re gluten free. I might try them next time with some grated cheese stirred into the mix, to make them more quiche-y than ever. Here’s Old Corn Liquor, by Joe Thompson. He’s remarkable! And this meal really did include corn in just about every form but liquor.